2 extra auto’s added to each 12 box case. 5 extra memorabilia cards added to each case. That means 7 out of 12 boxes will have 1 added hit! 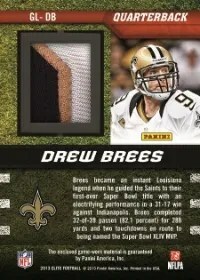 On these cards, the down marker spins around to revel either the down or jersey swatch. Panini Has less than 150 redemption cards in the set as of now … hoping make that less once the set goes live. RPS Rookie Inscriptions – recently added the Personal Edition variation that is limited to only 30 copies or less.